This restoring, fragrance-free body lotion keeps skin soft and comfortably moisturized. 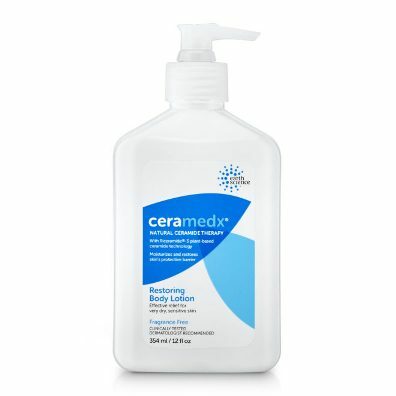 Directions: For best results, apply twice daily or as needed to soothe and relieve dry skin. Skin should continue to improve with regular, continuous use. For external use only. Avoid contact with eyes. Ingredients: Aqua, Carthamus Tinctorius (Safflower) Seed Oil, Glyceryl Stearate SE, Cetearyl Alcohol, Helianthus Annuus (Sunflower) Seed Oil, Glycerin, Cetearyl Olivate, Butyrospermum Parkii (Shea Butter), Sorbitan Olivate, Dimethicone, Ceramide NP, Lecithin, Phospholipids, Glycine Soja (Soybean) Sterols, Cannabis Sativa (Hemp) Seed Oil, Rosa Canina (Rose Hip) Fruit Oil, Sodium Hyaluronate, Tocopherol, Laminaria Ochroleuca (Kelp) Extract, Aloe Barbadensis Leaf Juice, Panthenol, Allantoin, Hydrolyzed Soy Protein, Ulva Lactuca (Sea Lettuce) Extract, Ascorbic Acid, Glyceryl Caprylate, Potassium Cetyl Phosphate, Glyceryl Undecylenate, Sorbitol, Citric Acid, Xanthan Gum, Ethylhexylglycerin, Phenoxyethanol.